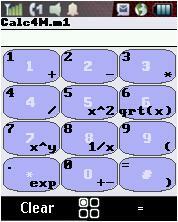 Calc4m.m1 is a powerful non graphing scientific calculator with an unwieldy name. What I like about this calculator is that every entry or operation takes only a single keypress. That makes it fast and easy to use for basic arithmetic as well as complex math. The available keys are shown right on the screen so you don’t have to remember them. Each of the standard cell phone keys has two functions which are shown graphically on the screen. The function in the top left corner is activated by a short keypress, the function in the bottom right corner is a activated by a long keypress. So to calculate 4 + 5 you press the 4 key, then do a long press on the 1 (+) key, press the 5 key and then press the # (=) key. Other keys: Left = undo; Right = redo; long press call = jump to basic artithnmatic screen. Why i cant Download this even i have an Data? Does your phone support Java ME apps? I’ve been using this for a few months on my Incognito and it’s one of my two favorite calculator programs. The W E R keys double for 1 2 3; S D F for 4 5 6 and Z X C for 7 8 9.